Dual Interface technology is very practical in day-to-day life and offers a big opportunity to financial and transportation institutions. 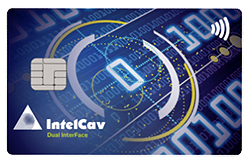 - Possible to integrate two technologies in the same card - Chip with external contacts is installed on the card surface and at the same time the antenna is soldered to the substrate of the plastic card. It works for contact and contactless apllications.